Pra Kong or Pra Lumpoon is made of baked mud. The design of this amulet was originated from Lumpoon. It was created more than 900 years ago. The exact date of discovering this amulet was not recorded. 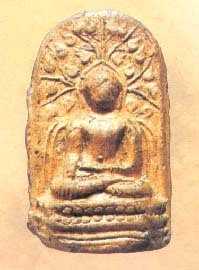 The only records was that this amulet was found in Wat PraKongReuSee, Lumpoon Province. Originally this amulet was called Pra Lumpoon because it was found in Lumpoon, later on collectors of this amulets called this amulet as Pra Kong Lumpoon as in Kong Grapan (Amulet of Invincibility. Comparing with another kru amulet Pra Bang Lumpoon, Pra Kong Lumpoon is much older in material and textual. The design of Pra Kong Lumpoon shows a Buddha sitting in sammahdti on a 2 tiers lotus pedestal. There are 9 lotus leaves on the first tier and similarly 9 lotus on the second tier. On top of the Buddha are Bai Poh (Bodhi Leaves), total 20 pieces of Bodhi Leaves; some resembling swaying of the Bodhi leaves and some in still. The shape of the amulet resembles a inverted glass and the back of the amulet is plain but protruding a small curve. The width of the amulet is 1.8 cm and height 2.8 cm. The material is made of soft mud. In some pieces, especially those worn out pieces, some shining material can be seen; these are Lae which are residues contained in the mud. Pra Kong Lumpoon has many types of colours such as See PiKoon Haeng (Dry Flower colour), See Mor Yai (Brick colour), See Khaow (White colour), See Bahng (Light colour), See Khiow (Green colour)and See Sawaht (Greyish colour). The differences in colours of the amulets were caused by the different temperatures used to bake the amulets during the time of creation. Pra Kong Lumpoon is a very good amulet, famous for it's Kong Grapan - Invincibility against weapons and danger. It is an extremely popular amulet especially in Northern Thailand and much sought after by collectors of old kru amulets. Prices are above 10,000 bahts or more depends on condition.